My clay career and my background working in non profits has brought about many opportunities to support community organizations over the years. 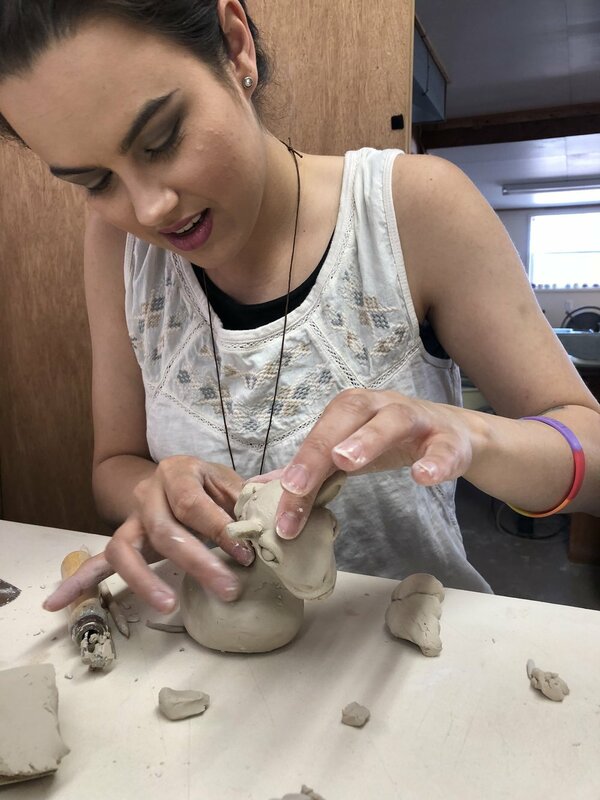 Clay work can be wonderfully therapeutic as a medium that brings folks together in a fun atmosphere of creativity and what's better than knowing your 'fun night out' is also supporting a local non profit organization. Clay for a Cause does just that and we hope you will join us at an upcoming event or help us spread the word by sharing on social media! 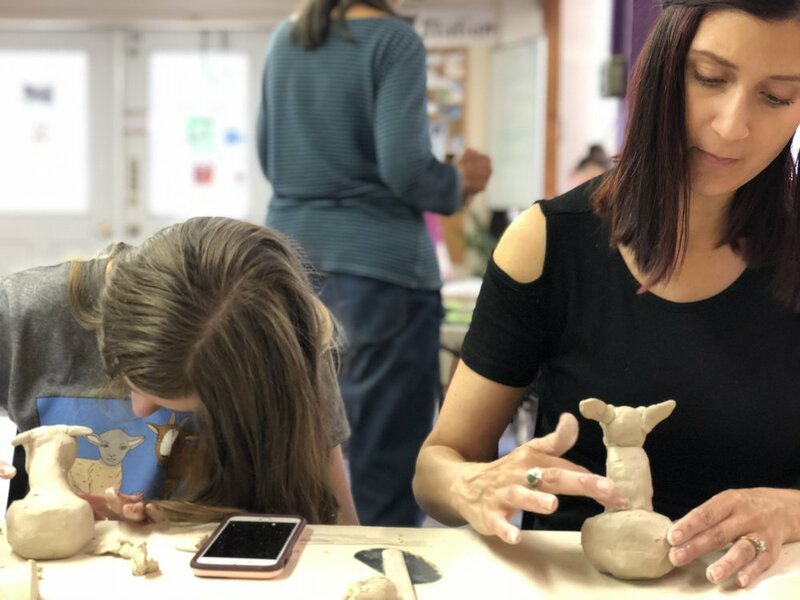 If you have an idea for a Clay for a Cause evening, please scroll down to fill out a simple form to connect with us! Riley Farm Mugs feature Theodore the hero on one side and the Farm logo on the other. they come in three colors and 35% of the sales go directly to the farm. Goats Galore! Was a SUCCESS! On Saturday May 5, Meiklem Kiln Works hosted a Clay for A Cause Fundraiser to benefit The Riley Farm Rescue. 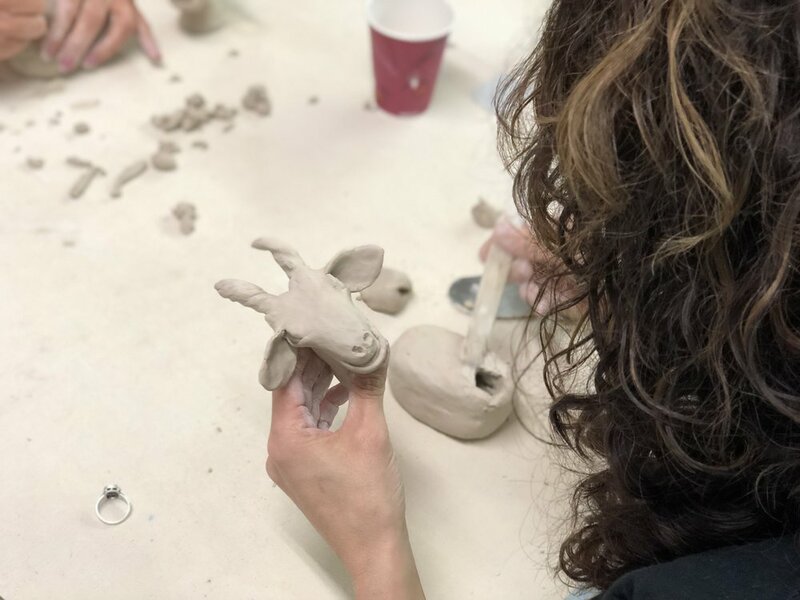 The workshop was so much fun to teach and we had a great group of supporters come out to try their hand at sculpting goats! We raised over $700 to benefit the family run non profit farm rescue. I have been collaborating with the farm founder and President Marla Riley and a talented local artist Olivia Mortrude to develop a piece of pottery that would continue to generate donations for this worthy cause. After months of prototypes and test firings the Riley Farm Mugs are making their debut! Click here to view/purchase the mugs! Or consider sponsoring one of the Riley Farm Animals by visiting their Patreon Page here! Stay Tuned as we work with non profits to develop more Clay for a Cause Events! Please fill out the form below if you have an idea for a Clay for a Cause event.